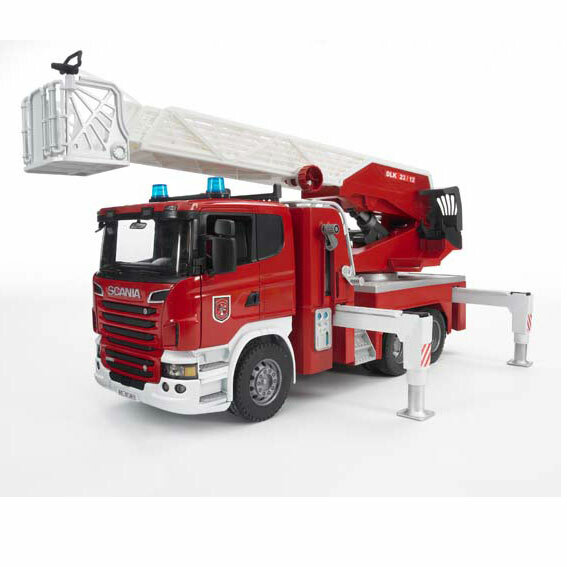 Just like the real thing, this 1:16 scale Scania R-Series Fire Engine with Telescoping Ladder and Water Pump from Bruder has lots of details, such as opening doors and mirrors that fold back, an integrated water tank that can be easily filled, a water hose with a fully functioning nozzle that can be wound up and held by Bruder figures (e.g. #60000 - not included), or secured to the basket. Other amazing details include the turntable ladder with rescue basket that can be moved out by a hand wheel and adjusted in height, four extendable support legs to ensure vehicle stability in any situation, and a large storage compartment with a door which folds up to provide extra space for storing tools. The included Light & Sound Module (#02801) has four different functions - horn, engine sound, indicator light and siren - makes this action-packed fire brigade even more fun.